Who invented French Fries? The name of a specific person has never been credited with the invention of French Fries and both France and Belgium claim credit for the invention. Neither claim has been conclusively substantiated. We do know that frying dates back to the Mesopotamians and that the potato was cultivated by the Incas of Peru and the Spanish Conquistadors introduced them to Spain in 1566. The oldest recipe for French Fries was published in 1856 and in modern times McDonald's changed their potato chips to French fries in 1949. French Fries are now one of the favorite snacks in all countries across the world. Definition of French Fries: French Fries are defined as long, finger-length, thin strips of potato fried in deep fat and eaten hot, also known as 'chips' in Britain. Fact 1: Who invented French Fries? The Frying cooking method, frying food in hot fats or oils, dates back to the Mesopotamian civilization that flourished c. 5000-3500 BC and spread to other cultures across the Far East and Europe. 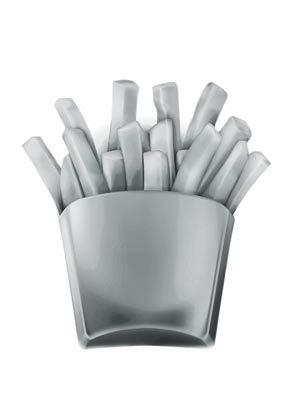 Fact 2: Who invented French Fries? French Fries would not be possible without the potato. The Inca Indians in Peru were the first to cultivate potatoes around 8,000 BC to 5,000 B.C. The Spanish Conquistadors conquered Peru in 1536 and about twenty years later brought the potato back to Spain and introduced the vegetable to Italy. Fact 3: Who invented French Fries? In 1578 Sir Walter Raleigh sailed to America, and is credited with bringing potatoes back to England, although they were already known via the Spanish. Fact 4: Who invented French Fries? Potatoes arrived in the British Colonies of the New World in 1621 when the Governor of Bermuda, Nathaniel Butler, sent two large cedar chests containing potatoes to Governor Francis Wyatt of Virginia at Jamestown. Fact 5: Who invented French Fries? Eventually, farmers in Europe found that potatoes were easier to grow and cultivate than other staple crops, such as wheat and oats. And people began to experiment with different ways of cooking the potato. Fact 6: Who invented French Fries? The origin or French Fries is disputed by Belgium and France. Belgians living in the in the Meuse valley, in what was once the Spanish Netherlands, claim credit for the invention of French Fries prior to 1680. But the French insist that there is a reference in France, dating from 1775, to "a few pieces of fried potato". The Belgian claim is in doubt because apparently the potato did not arrive in the Meuse valley region until around 1735 and is highly doubtful that peasants would have used large quantities of fat for cooking potatoes. The French claim hold more credence, purely by virtue of the name, but we are unable to trace the reference source for the French quote. Fact 7: Who invented French Fries? What we do know is that in 1802, President Thomas Jefferson had the White House chef prepare "frying potatoes in the French manner". Thomas Jefferson had lived in Paris from August 1784 to September 1789 as the American Minister to France, so it is likely that he enjoyed the dish during this period and had a fancy for 'French fried' potatoes when he became president. The fries would have been prepared by his French chef Honore Julien as "Pommes de terre frites à cru" translated as "raw potatoes deep fried, having been cut into small slices". Fact 8: Who invented French Fries? The oldest recipe for the dish was published in 1856, in 'Cookery for Maids of All Work' written by E.Warren. The recipe states "French Fried Potatoes. Cut new potatoes in thin slices, put them in boiling fat, add a little salt; fry both sides of a light golden brown colour; drain". Fact 9: Who invented French Fries? We therefore know that the term "French fried potatoes" was used by 1856 and common sense dictates that the term probably began to be shortened to "French Fries" around this time. Fact 10: Who invented French Fries? In America a recipe In America a recipe to "fry sliced potatos" in "half an ounce of butter, and a table-spoonful of milk" by Mrs. Mary Randolph was published in 1860 in a popular cook book entitled 'The Virginia Housewife: Or Methodical Cook'. Fact 11: Who invented French Fries? American Diners became extremely popular during the 1900's serving simple food such as hamburgers, hot dogs, club sandwiches, potato chips and French fries. Fact 12: Who invented French Fries? Richard and Maurice McDonald opened the first McDonald's restaurant in 1940. In 1949 they added milkshakes to their menu and changed the potato chips to French fries. Fact 13: Who invented French Fries? The J. R. Simplot Company (commonly referred to as Simplot) was founded in 1929 is credited with successfully commercializing French fries in frozen form during the 1940s. Fact 14: Who invented French Fries? Each year July 13 is celebrated in the United States as National French Fries Day. Fact 15: Who invented French Fries? By 2005 the Simplot Company supplied more than half of all French Fries for the McDonald's fast food chain. McDonald's over 14,000 restaurants in the United States, and nearly 23,000 in international locations and the tasty snack is enjoyed all over the world.